Joseph Lieberman's appointment as the Democratic candidate for vice-president prompted a range of reactions among the Islamists - also known as fundamentalist Muslims - who run the leading Muslim institutions in the US. (Moderate Muslims are rarely heard from.) Their unexpectedly diverse opinions about the nomination of an observant Jew offer an insight into the fears, hopes, and priorities of the radicals who speak for American Islam. 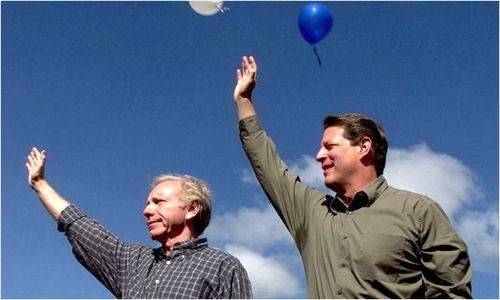 Joseph Lieberman (L) and Al Gore. To delegitimate Lieberman, some of these extremists raise the old dual-loyalty canard. 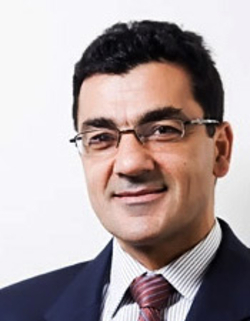 Khalid Turaani, executive director of American Muslims for Jerusalem, describes the Connecticut senator as having "gone to great lengths to serve the interests of Israel." Louis Farrakhan, head of the Nation of Islam, falsely calls Lieberman an Israeli citizen and offensively asks: "Would he be more faithful to the Constitution of the United States than to ... the State of Israel?" Second, the conspiracy-minded Islamists express pure despair at Lieberman's selection. "Many Muslims are justifiably upset," notes Yahya Abdul Rahman of the Islamic News and Information Network, an Internet site. The Jamaat al-Muslimeen International, a Baltimore-based group, sees the Lieberman nomination as a sign that Jews no longer must control the US from behind the scenes, but can do so openly; to this, the JMI ominously suggests that Muslims in America "should study the situation carefully and rethink their strategies." Surprisingly, other Islamists find much to like in Lieberman's appointment, at least in public. They appreciate his having signed up as an early co-sponsor of a Senate resolution that praises American Muslims and that endorses false Islamist grievances about "discrimination and harassment" against American Muslims. Aly Abuzaakouk, director of the American Muslim Council, deems Lieberman a "friend of the American Muslim community"; in 1998 his organization even bestowed its "Abu Saud Award of Excellence" on the senator, to thank him for his willingness to aid Islamist causes. Khaled Saffuri, executive director of the Islamic Institute, remembers Lieberman's having co-hosted (with fourteen other members of Congress) the first iftar dinner to break the Ramadan fast at the US Capitol. Saffuri finds that, with the exception of the Arab-Israeli conflict, "he is very positive ... one of the most reasonable senators with their dealings with the Muslim community." Likewise, Salam Al-Marayati, director of the Muslim Public Affairs Council, holds that Al Gore's selection of Lieberman "should be applauded" because it "would benefit Muslims" by enhancing pluralism in the United States. Translation: this appointment opens doors for Muslims to run for office. Hebah Abdalla, editor of iviews.com, an Islamist Internet publication, makes this point more explicitly: yes, the Lieberman appointment "sent shock waves through the Muslim world," but criticizing Gore "for choosing a member of another religious minority may some day come back to haunt us." Instead, Muslims should "commend Gore." These contrary responses reveal the two main fractures among American Islamists. First, they are divided in their priorities: Some see the Arab-Israeli conflict (and other overseas issues, such as Kashmir and Kosovo) as their primary concern. Others insist that the American Muslim community's interests come first. The latter worry about Lieberman's views on Israel but put more emphasis on his friendly policies toward themselves. Second, Islamists are divided in temperament, with insider types working the American system and jihadists standing outside it. For the former, getting invited to the White House stands as one pinnacle of achievement; another is to get Muslims elected to Congress. The jihadists denounce these goals as becoming "part of the capitalistic, racist, and imperialist power structure" which it plans to destroy. Whatever their differences, however, all Islamists have the same ambition, which is what they call the "Islamization of America." By this, they mean no less than saving the US through transforming it into a Muslim country. However remote the prospect, they believe time is on their side. 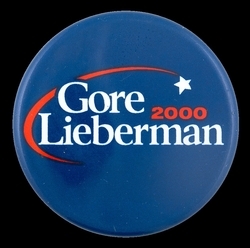 And, strange as it sounds, many of them see the Lieberman appointment as a step closer to that goal. Sep. 14, 2017 update: For an echo of the pro-Lieberman views expressed above, see "Muslim group honors Jews for empowering Muslims."